Gorkha is a scenic hill- town with great historical significance covering an area of 3,610sq. Km and has a population (2001) of 288,134. A 25 kilometer road off the main highway connecting Pokhara and Kathmandu brings you to an ancient Gorkha - the untouched and captivating town of Nepal. Gorkha is a picturesque hill- town that has a rich ancient history of its own. Gorkha is also the home of Gurkhas - the legendary brave warriors who fought with knives against guns. Situated on a small hillock at an attitude of about 1000 m, Gorkha offers panoramic view of snow-fed mountain. 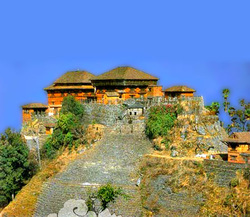 Gorkha durbar: This historical palace is situated on the top of the fortified hill above the township, about one hour's walk uphill from the bus station. On the west side of palace is the temple of Goddess Gorakhkali. There is also a famous cave sheltering the statue of Gorakhnath Baba (sage). The view of Manaslu and Himalchuli is spectacular. Gorkha bazzar: It is primarily a cobbled street market place where by people from neighboring hill dwellings come to trade. There are a few temples near about, but not much. Yet, it is worth a visit as it provides a very good vista of the quiet charm that soaks a typical hill village of Nepal. Gorakhnath cave: Ten meters below the palace's southern side, is the sacred cave temple of Gorkhanath. The cave is is carved out of the solid rock and is among the most important religious sites for mainstream Brahmins and Chhetris of Nepal. Upallokot: It is situated at a 20 minutes walking distance from Gorkha palace.There is a viewing platform at an altitude of 1520 meters in Upallokot from where the spectacular view of Gorkha palace and the sliver shining snow-fed peaks can be enjoyed. Manakamana: Manakamana is situated 12 km south of Gorkha bazzar. On a beautiful ridge south-east of the township of Gorkha lies the holy temple of Manakamana, the holy goddess of aspirations which is about 1,302 mt. above sea level.. It is a famous pilgrimage site for Hindus. Manakamana is 4 hour's walk uphill from Anbu Khaireni on Kathmandu-Pokhara Highway. We recommend a 1 night 2 days package to Gorkha.